Source text: Articles "Crusader of the Desert" from Vasko Barbic and British 'AA' Tanks from William E. Platz. Photo's and models from HenkofHolland. Most of the kits are converted from Hasegawa Crusaders kit 26. 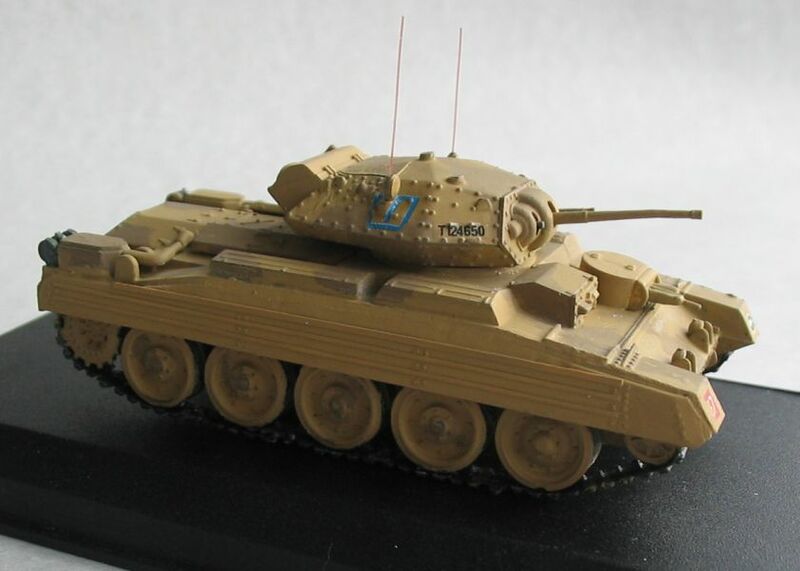 The Crusader concept stemmed from the "Fast Tank"concept, designed and produced around 1930 by the American Walter Christie, and could have evolved to generate an all-round fine tank. Instead, Crusader paid the consequenses of ill-defined high command theories and uncertain piecemeal decicions, hastily made by committee, and suffered from unfortunate shortcomings for most of its existence. 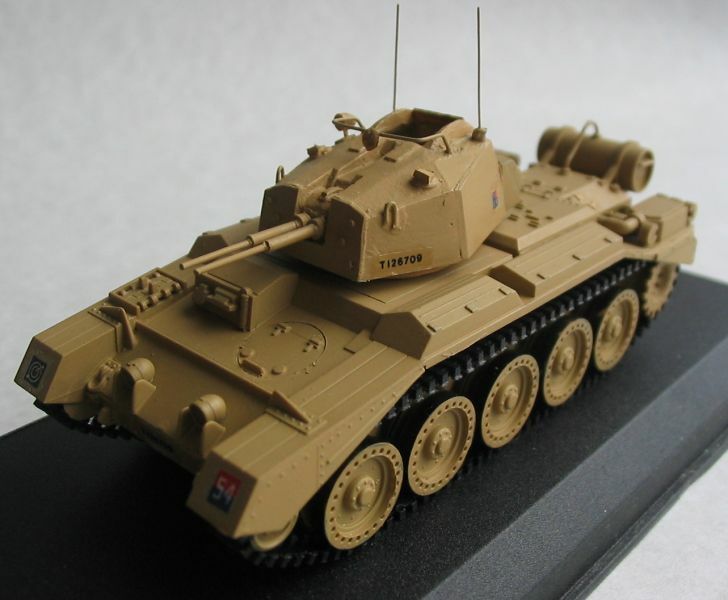 Crusader came from a lineage of "Cruiser Tanks" produced to complement the heavier armoured and slow going "Infantry Tanks" Then in service, such as the Matilda. 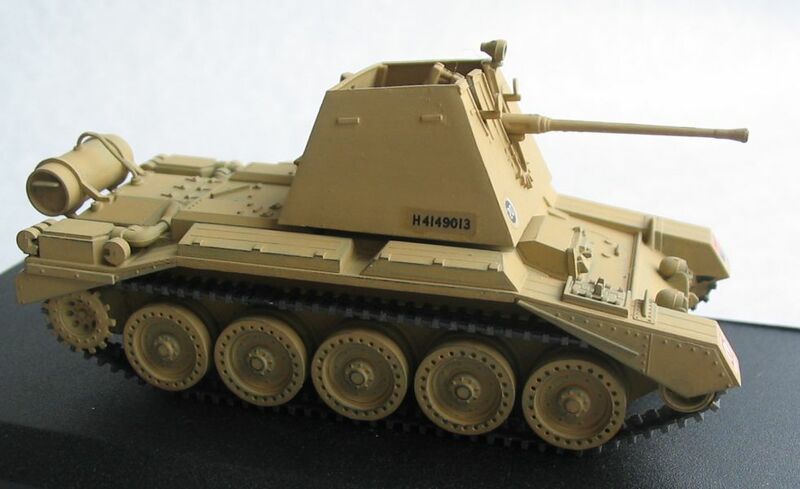 Conceived to exploit the latter's break through, cruisers were characterised by a light armour, a good range and speed and a running gear and suspension designed for fast going. 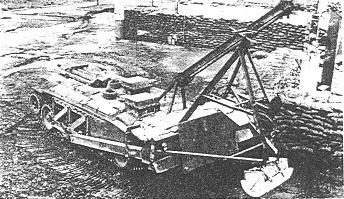 Their main armament invariably consisted of the ubiquitous two-pounder or 40mm gun.The narrow and long hull was of simple rectangular section, stiffened with cross-braces and bulkheads to withstand the starins and stresses provoked by the fast riding on rough terrein and the consequent rolling and pitching. The multifaceted turret was given its characteristic hexagonal cross section -developing into an octagonal one towards the centre- to afford more internal space, limited otherwise by the narrow hull and small ring diameter. The suspension, a slightly improved version of the American Christie design, consisted of one spring unit for each of the wheels, enclosed in an individual housing within the double-walled vertical sides of the hull. 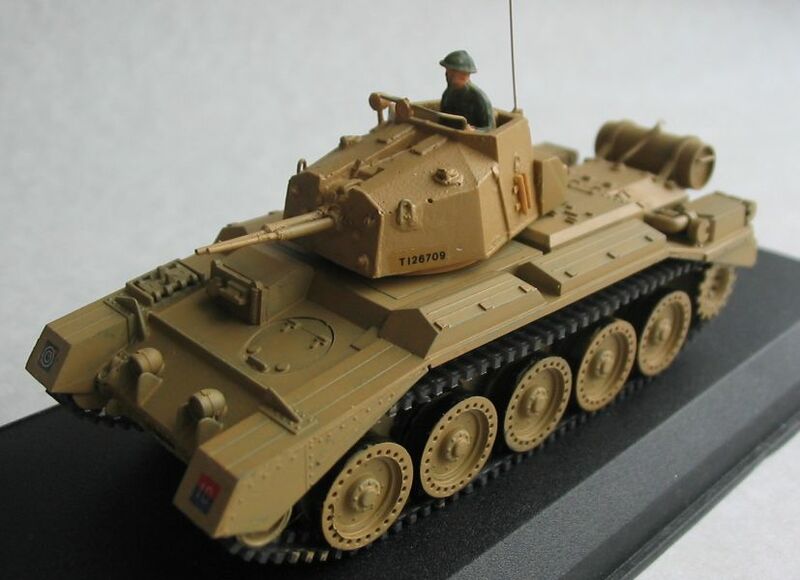 Like most other British tanks of the period, Crusader was armed with a two-pounder anti-tank gun, a 7.92mm Besa mg (derived from an original Czechslovakian design, the Zb-model 53) coaxially mounted at the right of the main gun, a two-inch bomb thrower further to the right, and a second Besa MG installed in a small auxiliary turret, set in the left side of the glacis, next to the driver's compartiment. The latter had a pistol port in the armoured hood, for the use of his side arm. The crew was also provided with a fairly comprehensive variety of optical devices; there was a side look-out and a prismatic visor for the driver, a telescopic sight for the auxiliary machine-gunner, a front look-out and a telescopic sight for the main gunner, a periscope for the loader and finally, for the commander, a periscope in the centre of the roof and two look-outs, one in the left and one in the right side of the turret. 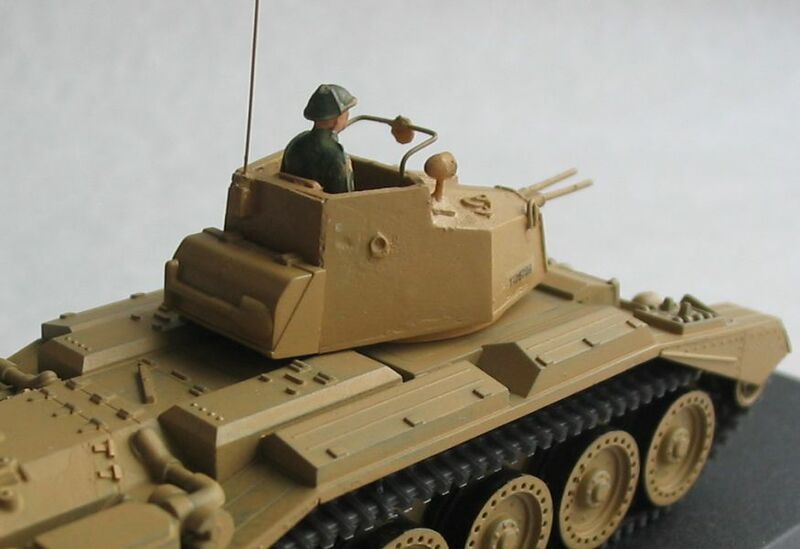 For external communication, the commander had at his disposal a No.9 radio set, fitted behind him in the rear turret bustle. This was later replaced with a No.19 wireless, characterised by two aerial masts. Power came from a Liberty engine and a gearbox manufactured by Nuffields, who also designed and produced the Cruasader. 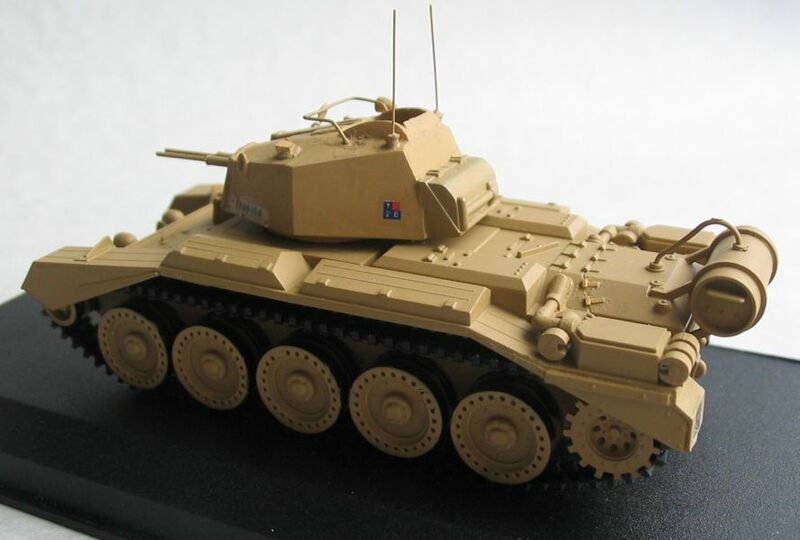 Being the direct descendant of the cruisers A13 and Covenanter, Crusader retained several of their features and consequently their shortcomings as well as their advantages. 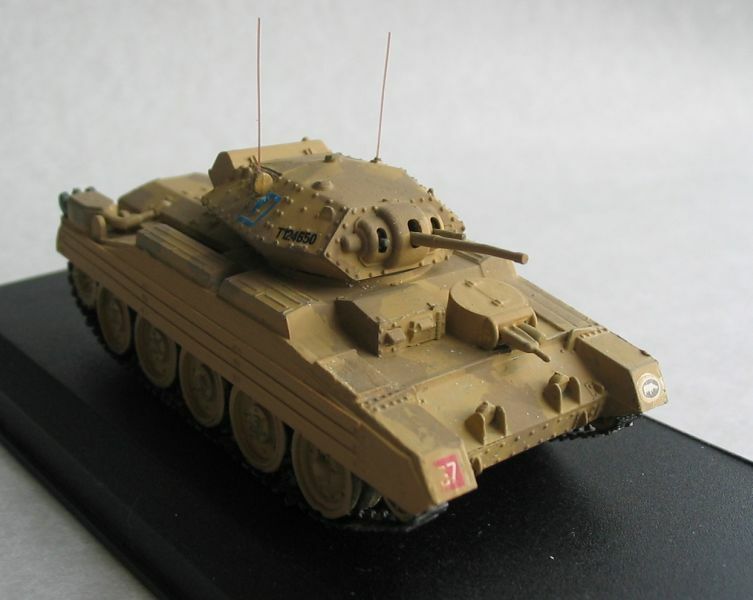 Its Christie-type suspension, large dished wheels, the design of its hull and the exellent power-to-weight ratio gave the tank good speed and mobility, particularly in the North-African desert, where it spent all of its service as a cruiser tank. These characteristics and the low, sleek silhouette made Crusader a diffecult target to hit when charging. Unfortunately this was offset by several inadequacies. Although longer than its predecessors, its ground pressure was not entirely satisfactory, due the narrow wide of its tracks which, in addition, the tank tended to shed a bit too often. 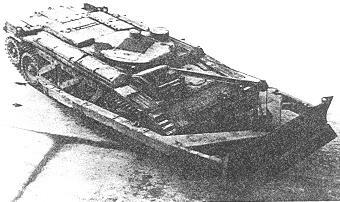 Mechanical breakdowns also caused the loss of an inordinate number of tanks, while in action. 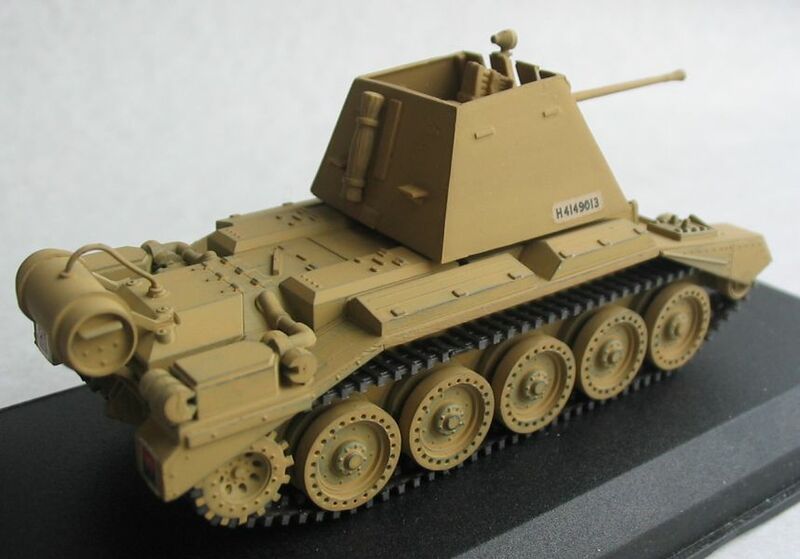 The armour was too thin to withstand shots from the Italian 47mm or the German improved 50mm guns. The turret, because of its particular shape, presented dangerous shot traps.Ventilation was poor all round and when the secondary machine-gun was fired,both the gunner in his tiny auxiliary turret and the driver on his right, suffered badly from cordite fumes. The two-pounder gun had only anti-tank capabilities and could not fire high explosive shells. 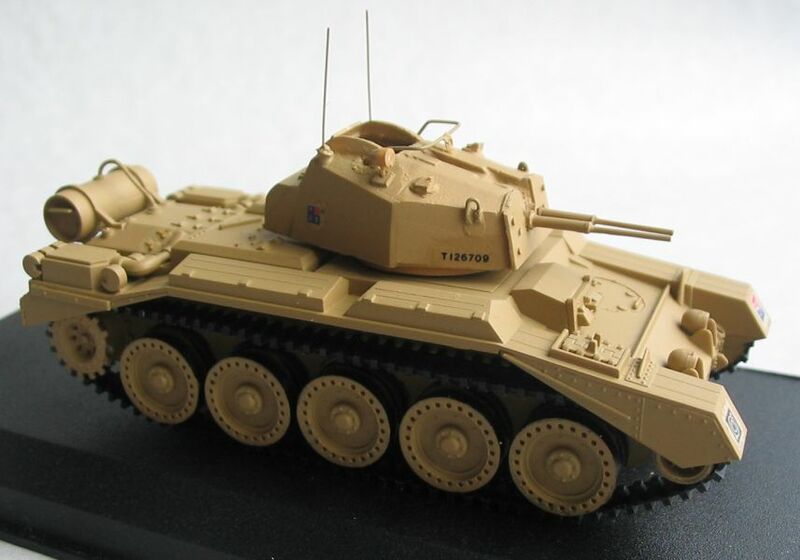 Crusader was also plagued during most of its operationale life, in the desert with air filters problems, defective coolingfan systems, etc., all shortcomings that basically were the consequences of illdefined specifications, hasty development and insufficient trials in times of emergency. But, given the circumstances and the situation in those fatefull years 1941 and 1942, it was the best that could be made available and rushed to the embattled British armoured units in Egypt. 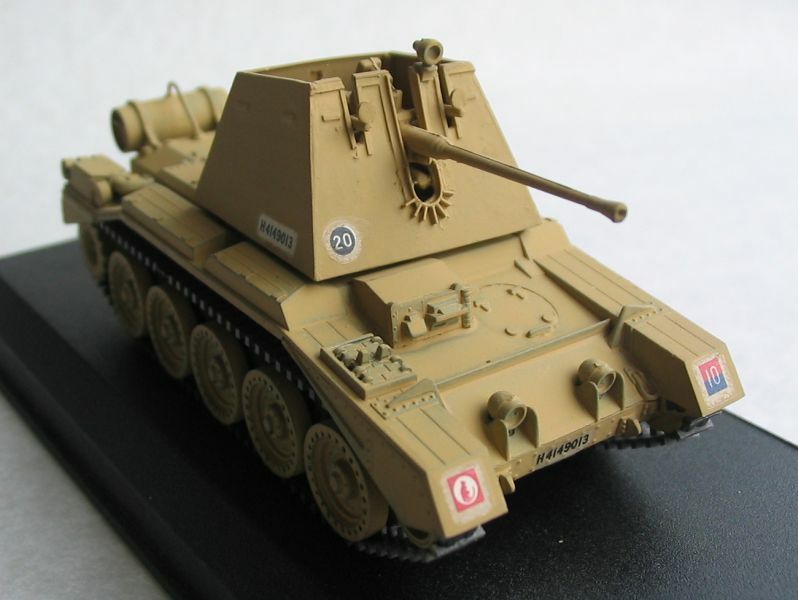 In conclusion one must say that, all considered, Crusader acquitted itselfs fairly wll in the face of Axis force equipped with 88mm, 75mm, 50mm and 47mm anti-tank guns, whether in defensive emplacements or mounted on heavier and better armoured tanks. 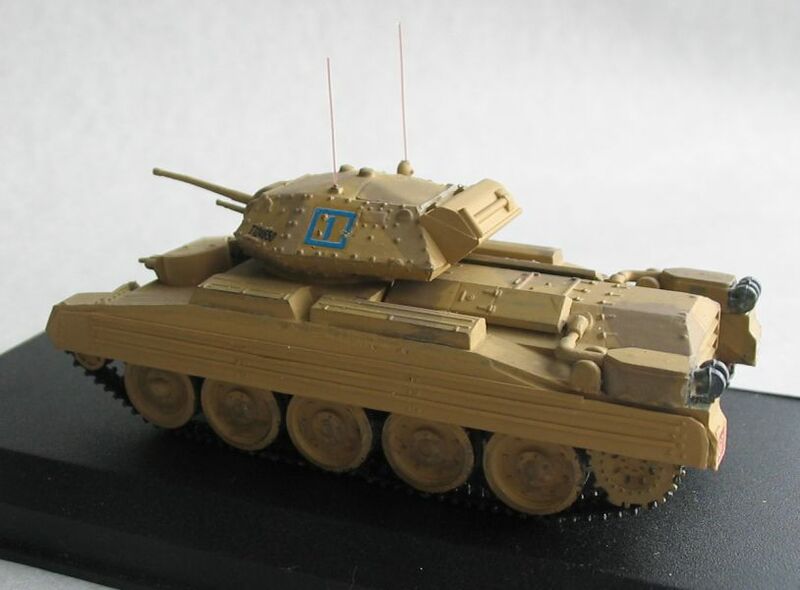 By 1943, the Crusader series of Cruiser tanks was being phased-out of the combat role, and a new source of chassis became available. With the larger capacity of the Crusaders, larger weapons could be mounted, and the British were quick to seize the opportunity. 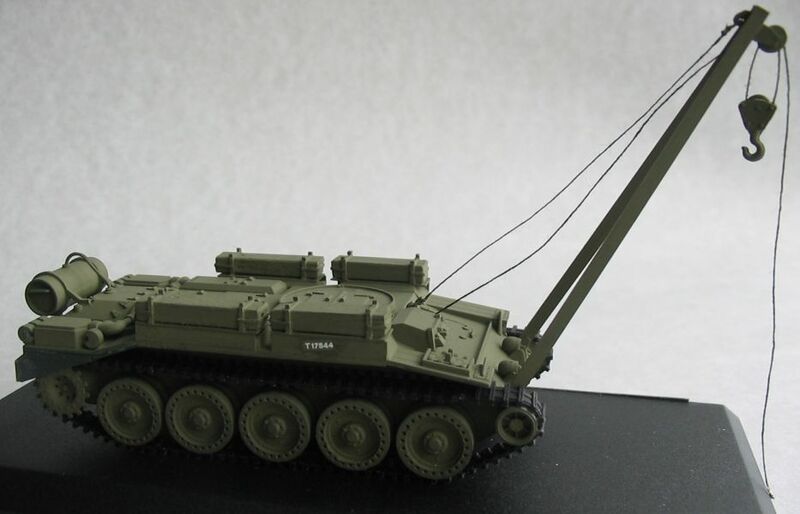 Experiments were made with the excellent 40mm Bofors AA gun and with a triple 20mm Oerlikon mount. 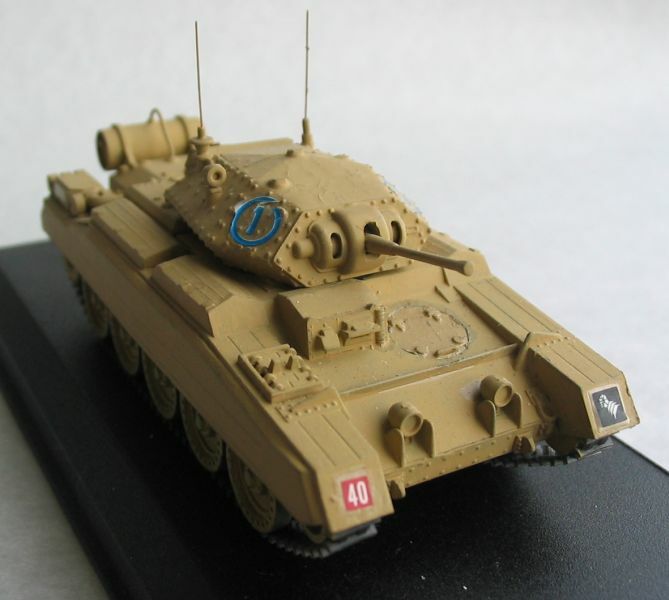 Originally, the 40mm field mount simply replaced the turret on the Crusader III tank. 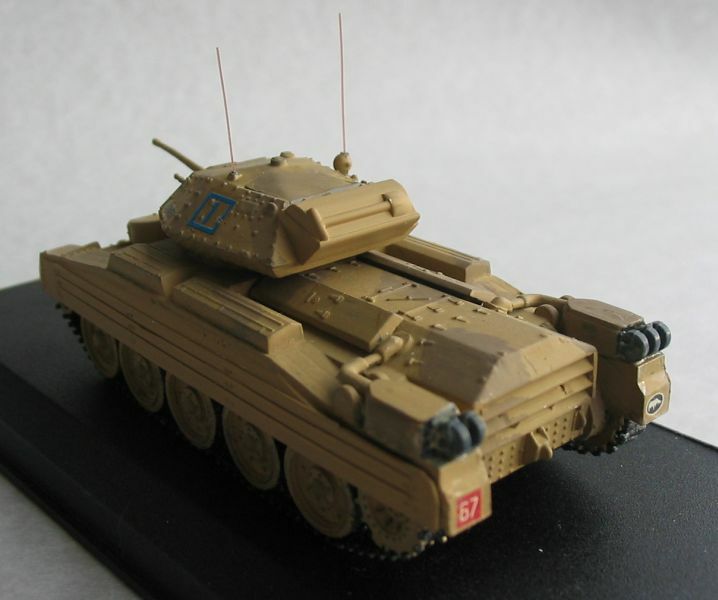 This became the Crusader III,AA, Mark I; and later modifications included a lightly armoured turret, surrounding the gun. 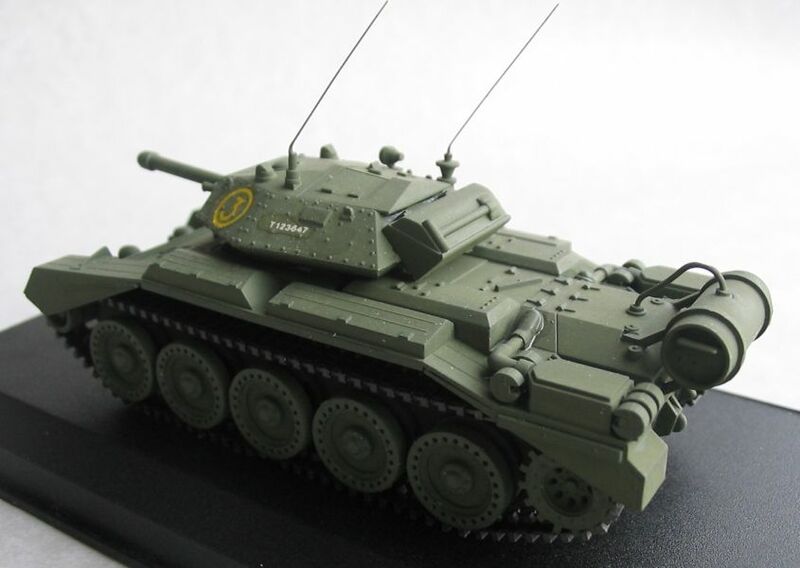 The triple 20mm version was never mass-produced: however, a new mark, with a fully enclosed turret, soon appeared. 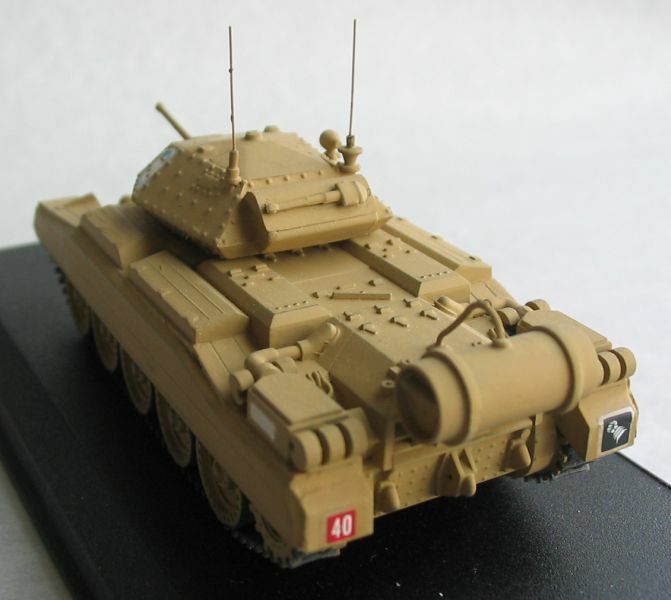 The Crusader III, AA, Mark II, as this variant was called, carried a twin 20mm mount, similar to the weapons used for anti-aircraft defense on naval vessels. 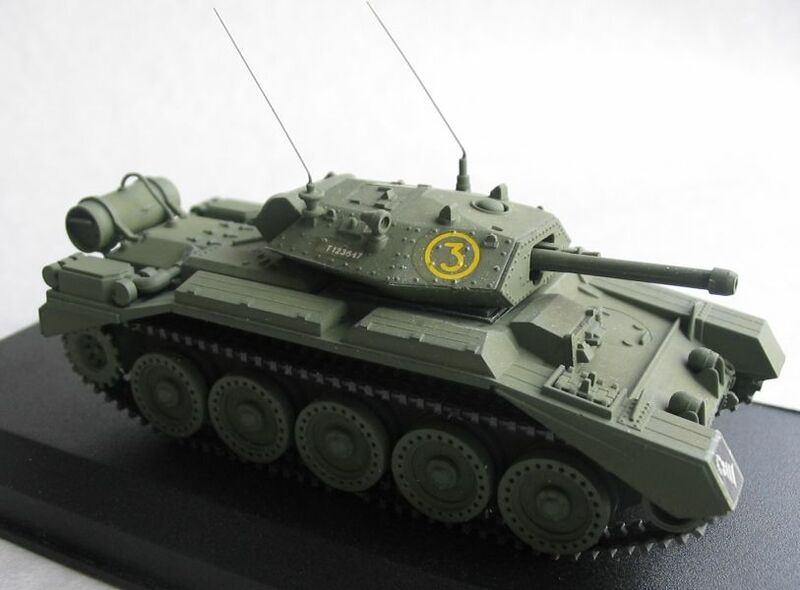 An additional modification to the new turret resulted in a third Mark of the Crusader II, AA; however the changes were primarily internal, and principally involved moving the radio from the turret to the hull. Crusader Gun Tractor and AVR's. The Crusader Gun Tractor were converted from the Crusader MKII cruiser tank and used as armoured tractor for 17-pounder AT-gun. 600 were produced from March 1944 to April 1945. 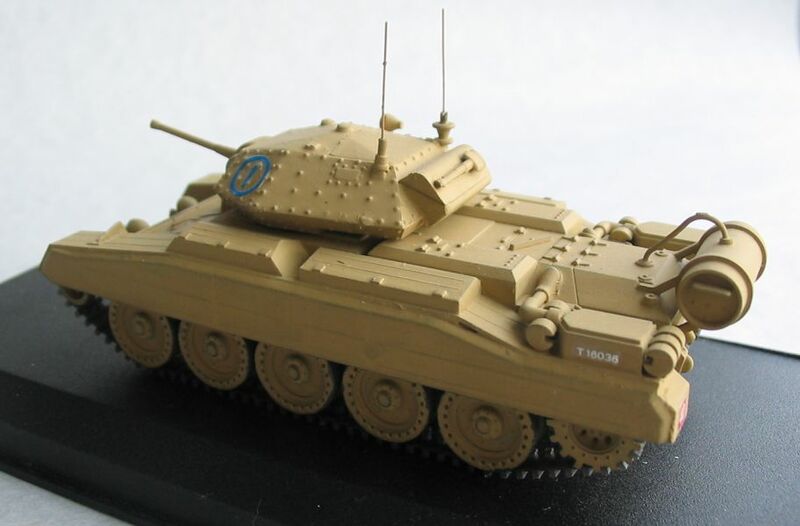 They were converted by Ruston and Hornsby Ltd. Also were many Crusader II and III converted to AVR's (Recovery Vehicles) From the AVR vehicles were many variants, with dozer blades and / or crane's. 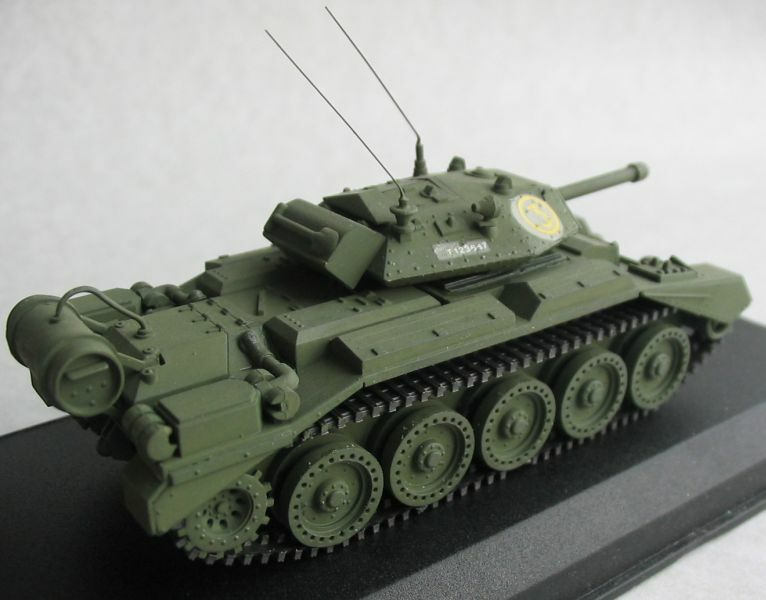 Crusader I :...Initial production model. 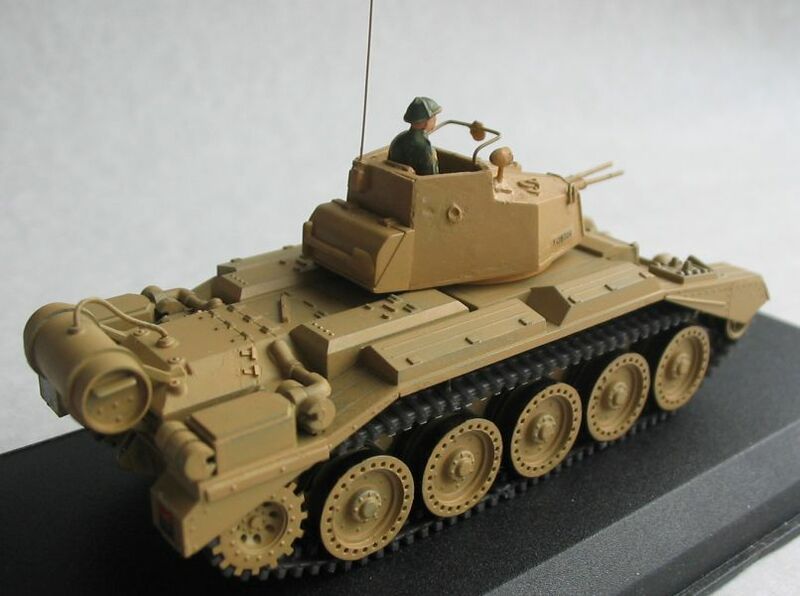 Crusader OP and Command :...Fitted with a dummy gun for use as observation post or for general command post with extra radio. 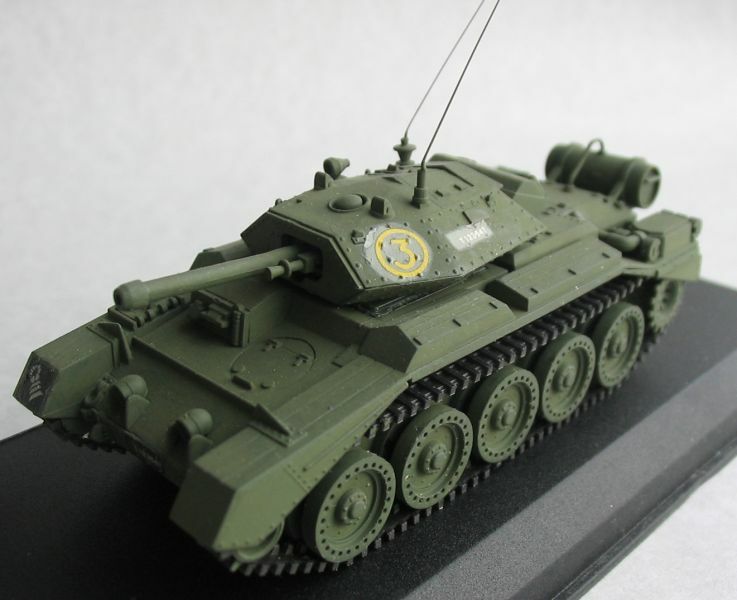 Crusader III, AA Mark-I :...Normal turret replaced by 40mm Bofors gun behind shield. Crusader III, AA Mark-II and -III :...As Aa Mark-I but with 20mm twin Oerlikons. 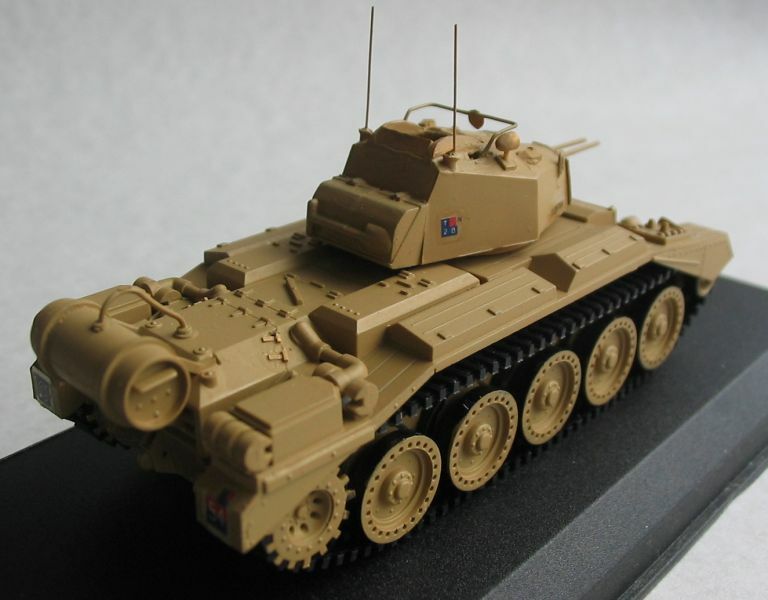 Crusader with triple Oerlikon :...A few vehicles were fitted with a special open mount fitted with three Oerlikons. 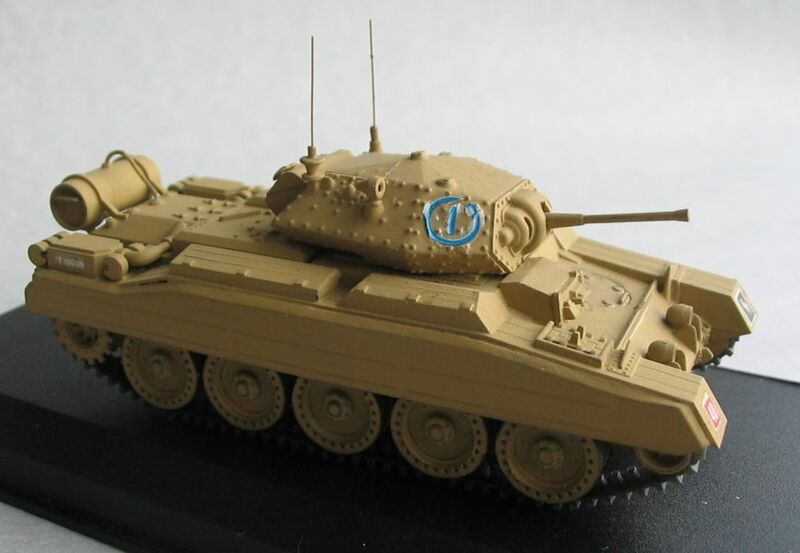 Crusader II, Gun Tractor Mark-I :...A special conversion of the Crusader hull for use as a tractor to pull the 17pdr anti-tank gun. In service 1944-45. 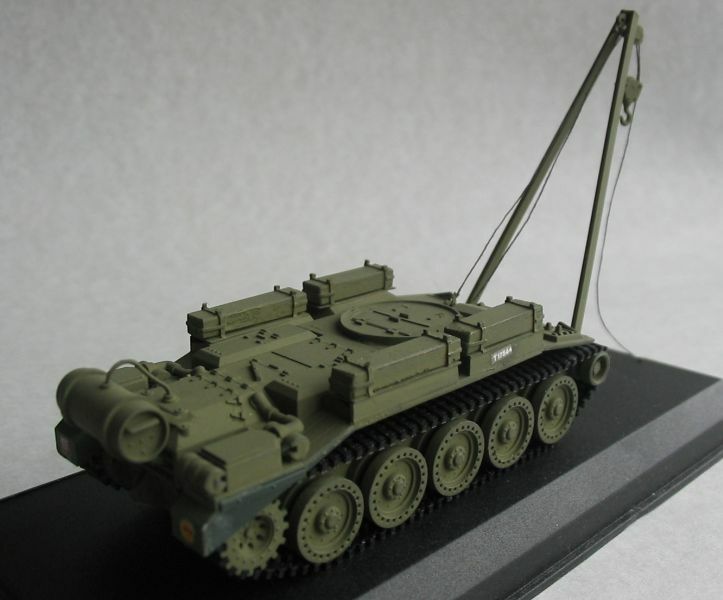 Crusader ARV :...Turretless version with a jib crane on front. 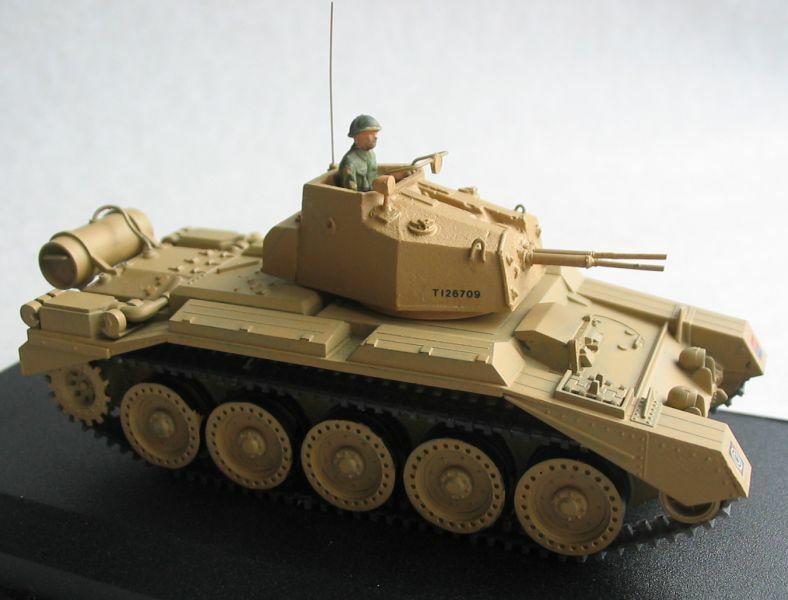 Crusader Dozer :...Turretless version used by the Royal Engineeers. 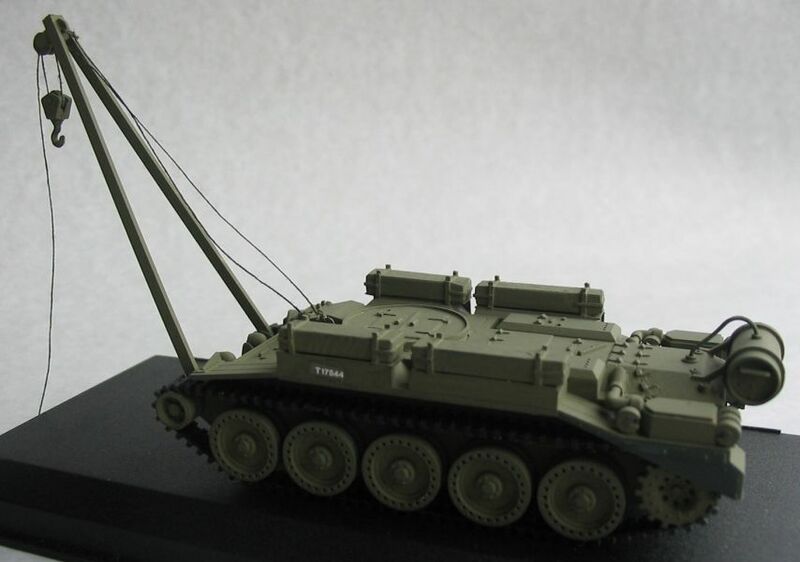 Crusader with AMRA Mark 1d :...Mine clearing device -not used in action.